At the Regroup after two of yesterday’s five stages on the Brick & Steel Border Counties Rally, this picture was taken showing three drivers with arms folded, and one with hands in pockets. Guess which one won the rally? No doubt some psychologist will have a view on body language and exuding confidence, and no doubt others will just think he had holes in his pockets, but I just thought it oddly funny. 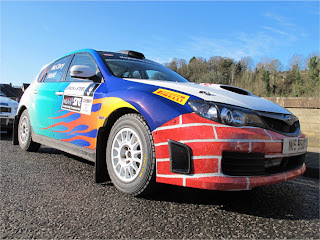 As most folks in the rallying fraternity up here know, John McClory of Brick & Steel who sponsors the Border Counties and supports the Ecosse Challenge is one of the nicest guys in the sport. He’s not one for standing up and talking, but he does muck in. For instance, he entered the charity Kart-Push last night, twice. 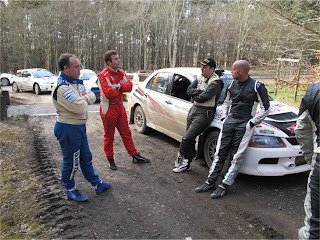 Once with Kart-Push CofC John Tullie (and surely a conflict of interest there – sponsor and event official?) and then later on with the youngster who won the ‘rally car design a livery competition’. The Kart-Push event consisted of a two person crew, one of whom steered the kart while the other pushed. Against the clock, which was professionally timed to tenths of a second by the SMART boys, the Kart had to be pushed through two ‘gates’ then stopped astride a third ‘gate’ for a wheel change, before a final push over the finish line. Simple, but a barrow load of fun, and huge crowds had gathered outside Jedburgh Town Hall for the mass stupidity. 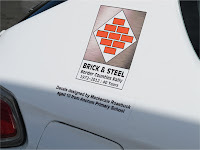 Prior to the rally, the event organisers had arranged another competition with the local Ancrum Primary School to design a rally car colour scheme. 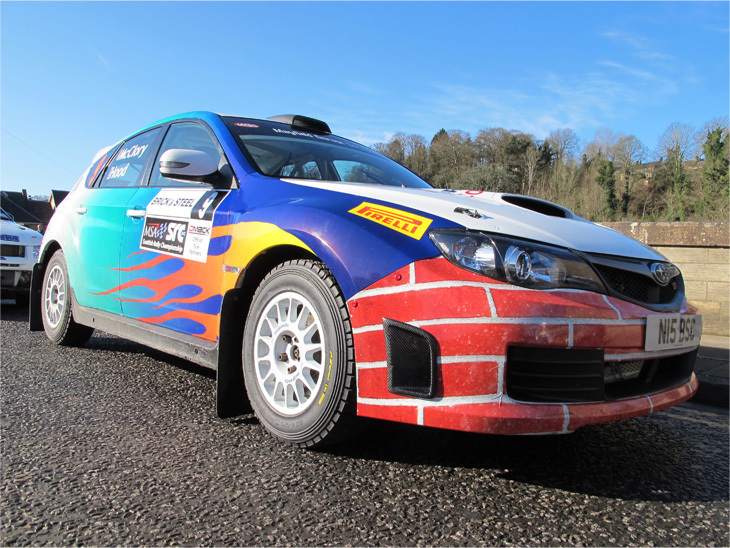 Ten year old MacKenzie Roaebuck not only won the competition, but John McClory had arranged to have his design applied to his Subaru Impreza for the rally. The youngster also got to flag off the cars at the Rally Start and then got to steer the kart later that evening while John pushed him round the course. A nice way of involving the community, eh? As for the BIG Border Rally report itself, it won’t be on the 'jaggybunnet.co.uk' web-site till later in the week, I’ve got an early flight in the morning to drive a van up a Spanish mountain!